THIS PRODUCT TO RAIN OR MOISTURE. rights of copyright owners and be contrary to copyright laws. Camcorder OPTURA and all its accessories. water or in rainy/moist situations. serious damage to the product. one blade wider than the other). from which the cords exit the product. product dealer or local power company. wall outlet and disconnect the antenna. due to lightning and power-line surges. can fall into such power lines or circuits. objects have fallen into, the product. fire, electric shock or other hazards. purchase to aid identification in case of theft. pleasure for years to come. will add to your recording enjoyment. use its full range of features. itself e.g. Press the EJECT button. display them as blurfree still pictures too! AC, 50/60 Hz) to the DC current used by your camera. the adapter away from the TV or the antenna cable. power from an AC outlet. Lift up the battery cover. Insert the DC coupler into the camera, with the arrow face down. Connect the DC coupler to the adapter. Plug the adapter into an AC outlet. Remove the DC coupler after use. • Press and hold the BATTERY RELEASE knob to the left. • Always turn the camera off before removing the power source. 1. Attach the battery pack to the power adapter. 2. Plug the adapter into an AC outlet. • The indicator glows steadily when the battery pack is fully charged. 3. Take the battery pack off the adapter and insert it into the camera. • Align the triangle on the battery pack with the line on the power adapter. • Make sure the DC coupler is not connected. arrow, with the arrow facing down, until it clicks into place. 4. Remove the battery pack after use. • Press the BATTERY RELEASE knob to the left. to install the back-up battery. 1. Make sure that you have inserted a power source. couple of seconds for the cassette compartment to open automatically. 3. Load or unload the cassette. • Insert the cassette gently with the window facing out. • Remove the cassette by pulling it straight out. 5. Click the cover back into place. automatically, or attempt to close the cover. store it in a cool, clean, dry place. and the red mark covered. You are unable to use the cassette memory function with this camcorder. Have you completed the following steps? • Attached a power source (p. 8). • Loaded a cassette (p. 10). • Removed the lens cap and fastened the shoulder strap (p. 54). • Adjusted the viewfinder/removed the LCD cover (as applicable, p. 54). 1. Press down and slide the POWER switch to CAMERA. • The camera power indicator lights up red. 2. Turn the program selector to [pp. 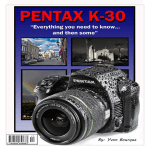 point and shoot without making any manual adjustments (see p. 35). 3. Turn the standby lever to MOVIE. 4. Press the start/stop button to begin recording. • The tally lamp flashes rapidly and REC appears in the display. 5. Press the start/stop button again to pause recording. 6. Turn the standby lever to LOCK. power, and prevents accidental operation of the start/stop button. Return the LCD screen flush to the camera body, and replace the LCD cover. modes. LP extends tape usage by 1.5 times. • To check that the camera is recording correctly, make a test recording first. digital video head cleaning cassette. • You cannot monitor the sound from the speaker when recording. • For tips on how to make better videos, see page 22.
during playback and the time code may not be written correctly. noise when played back on this camcorder, and vice versa. • Turn the zoom control towards W to zoom out to wide-angle. • Turn it towards T to zoom in to telephoto. • Move the control slightly to zoom slowly. than double the camera's zoom range. optical zooming (up to 14×) and digital zooming (14× to 35×). wide-angle position. You can focus on a subject as close as 3/8 in (1 cm). • Image resolution is slightly lower when the magnification is greater than 14×. or with the mosaic fade and window wipe. error and will not affect the recording. • Avoid touching the LCD screen. • Do not hold the camcorder by the LCD panel. for you to view the image. In this case, switch to using the viewfinder. the viewfinder when the camera was turned off. • You cannot adjust the volume of attached headphones. plays back the sound track via the built-in speaker (p. 15). To play back your recordings on a TV, see p. 19. To use the wireless controller, see p. 27. 1. Attach a power source and slide the POWER switch to VCR. • The power indicator lights up green. 3. Press the PLAY e button to start playback. To end playback, press the STOP 3 button. To wind the tape forwards, stop playback and press the FF 1 button. To wind the tape backwards, stop playback and press the REW ` button. commercially available digital video head cleaning cassette. Press and hold to play back continuous frame advance. Press and hold to play back continuous frame reverse. Press the PLAY e button to return to normal playback. Press PLAY e to return to normal playback. Press the PLAY e button to return to normal forward playback. Press the ×2 button during normal playback. Press the –/4a button and then the ×2 button during normal playback. sound track cannot be heard. recordings. You will need to attach a power source to the camera (see p. 8). See your TV or VCR instruction manual for further details. AUDIO terminal 9 (right). Do not connect the yellow plug. • Set the TV/VIDEO selector on the television to VIDEO. terminal 9 (right). Connect the yellow plug to the yellow video terminal 0.
an unpleasant high-pitched squeal, called feedback, may be produced. VCR instead of the TV. Follow the instructions on the previous page. • The RF unit and RF adapter cables are available optionally. • If your TV has flat twin-lead cable, use the 300–75 ohm adapter. • Use the coaxial cable with F-connectors. If your TV has flat twin-lead cable, use the 75–300 ohm adapter. cable. Tighten the screws again. the RF unit to the video channel. playback (channel 3 or 4). controls by touch, without taking your eye off the action. height.) and operate it with the wireless controller. viewfinder exposed to bright sunlight or it may melt. Watch out for distracting objects in the background. your viewpoint for each shot. introduction to subjects at the bottom. record stable images even if you are shooting from a moving car. button to turn the image stabilizer on or off. • The i mark appears in the display when the stabilizer is on. • The image stabilizer is designed to deal with a normal degree of camera shake. • Keep the image stabilizer turned off when the camera is mounted on a tripod. Turn to the appropriate page for a detailed explanation of each function. 1. Press the MENU button to open the menu. 4. Press the controller up or down to choose its setting. 5. Press the MENU button to close the menu. keys in place of the FlexiZone controller. reverse the polarity of the batteries. effective range will be less. • Do not leave the controller exposed to direct sunlight, or in hot or humid places. • When the batteries run out, replace them both together. wireless controllers being used nearby. 2. Select the OFF setting and close the menu. • S | appears in the display. You may therefore decide to turn it off. when the camera receives a signal from the wireless controller. display or hide it during playback (see p. 30). backup battery before you begin (see p. 56). 1. Put the camera in record pause or VCR mode. 2. Open the menu and select D/TIME SET. • The year display starts to flash. to move to another part of the display. • Press once to scan a year at a time. Press and hold to scan quickly. • Once you move from the year, the next part of the display starts flashing. 4. Set the months, days, hours, and minutes in the same way. 5. Press the MENU button when finished, and to start the clock. • The date can be set to any year between 1997 and 2020.
seconds are set to zero, you leave the menu, and the clock starts. date and time again from the start. Press down and slide the POWER switch to VCR. Open the VCR menu and select D/TIME SEL. Choose between DATE, TIME and DATE & TIME. Press the MENU button to close the menu. special data section of the tape. stop, fast forward, rewind, play or still mode. Press the wireless controller’s DATA CODE button. • Press it once to display, once more to hide it. 1. Select DATA CODE from the VCR menu. 2. Choose between DATE/TIME, CAMERA DATA and CAM. & D/T. 3. Press the MENU button once more to close the menu. - During playback of a blank section of tape. - If the tape was recorded on a camera without a data code function. - If noise or tape damage prevents the data code from being read. • Data code is not displayed during high speed playback modes. the data code may not be displayed correctly. tape for approximately 6 seconds. The exposure is automatically adjusted. CAMERA and turn the standby lever to PHOTO). • “PHOTO” is shown at the bottom right of the display. 2. Press the start/stop button lightly. picture and then press down the start/stop button lightly once more. button, adjust the focus manually (p. 47) and retry. also records the sound, and the display also shows the still picture. 3. Press the start/stop button fully down to take the still picture. (program selector/power off do not respond until recording is complete). • You cannot use digital faders while the camera is set to photo mode. • You cannot use FlexiZone AF in photo mode. • The camera operates in progressive mode when taking still pictures. (available as an optional accessory, see page 45). • Only take “photos” where it is bright enough to see the image in the display. Move quickly through still pictures recorded anywhere on a tape. • You can only use this function from the Remote Controller. 1. Press down and slide the POWER switch to VCR. • Press once to move to the start of the previous/next still pictures on the tape. 5 still pictures on the tape. mark and the number of photos to search through. • Press the 3 button to end your photo search. camera may skip straight past it. 1. Slide the POWER switch to CAMERA. recording program except Easy Recording. 3. Open the camera menu, and point the arrow at MOVIE MODE. 4. Choose the PRO.SCAN setting and close the menu. • PRO.SCAN appears in the display. MOVIE MODE at the camera menu. mosaic fade and window wipe. • Normal mode cannot be used with the Negative-Positive Conversion program. • Progressive scan video may appear slightly jerky during normal playback. 1. Make sure the camera is in record pause mode. check the picture in the display. • The camera returns to record pause mode. then go on to shoot the next scene, without producing any noise in the picture. • Noise may appear on the screen during record search and record review. functions to match the recording situation. the program selector to the [ position. • For normal shooting conditions, set the selector to n (Auto). displayed and then disappears after 4 seconds. leaving you free to point and shoot. Also, autofocus and image stabilization cannot be turned off. effects, such as a “streaming” background when panning, and for shooting in lowlight conditions. display. Select your desired shutter speed by turning the Av/Tv CTRL. • The image quality may suffer slightly if you use slow shutter speeds for lowlight conditions, and the autofocus may have not give accurate results. 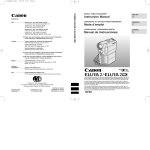 Canon Speedlite or Video Light (available as optional accessories, see page 66). setting so that the display stops flashing and lights up continuously. sharp focus). It is the reverse of shutter-priority. automatically to give the correct exposure. you to shoot in low-light conditions. shown in the display. Select your desired F number by turning the Av/Tv CTRL. a higher value for the F number. Av or Tv to lock/adjust the exposure (p. 46). so that the display stops flashing and lights up continuously. other settings such as white balance. • You can also then adjust the tint and color. picture when using the Film Adapter (FP-100). • When you adjust the tint or color, M appears in the display. will disappear from the display. automatic levels in the same way. Photo System, the others to 35 mm film. few seconds after your last operation. scene, the image is wiped back off. gradually fades in from a black screen. again before you fade out) by pressing the D.FADER button. The name of the fader is shown in the display when it is activated. 1. Put the camera in record pause mode. display the fader options on the screen. • The flashing display changes. • Alternatively, keep the button pressed down to scroll through the list. and your chosen fader will be put into the memory. • The camera automatically exits the fader option screen after a few seconds. • The name of your chosen fader is shown in the display. 5. Start or stop recording. • The recording will start or stop with the selected fade. • Sound and image fade together. - You have turned on the digital zoom or 16:9 effect at the menu. camera is set to PRO.SCAN movie mode). 1. Select 16:9 from the camera menu and turn the effect ON/OFF. 2. Press the MENU button once more to close the menu. • “16:9” is shown in the display when you switch the 16:9 effect on. will appear to be vertically “squashed” (compressed). 1), leaving two channels free (stereo 2) for you to add new sound at a later date. 2. Select “12 bit” and close the menu. • “12 bit” is shown in the display for approximately 4 seconds. • You cannot add new sound to a tape using this camcorder. • For details of playing back a tape that has new sound on stereo 2, see page 58. 1. Open the camera menu and point the arrow at WIND SCREEN. • WS | is shown in the display. This is useful when you want to include yourself in the picture when recording. 1. Press the self-timer button. • SELF TIMER appears in the display. 2 Press the start/stop button. in the display (e.g. “5 sec”). • SELF TIMER disappears from the display when recording begins. 3. Press the start/stop button to end recording. flashes more quickly for a few seconds before the camera starts to record. • To cancel the self-timer press the self-timer button once more before recording. Once the countdown has begun, press the self-timer button to turn it off. • You cannot use the self-timer with the Negative-Positive Conversion program. mark is also displayed at this time. and the zoom is locked. Pressing the start/stop button fully down releases a preexposure flash burst that sets the flash intensity, exposure and white balance. The main flash is then sent out. lights up constantly in the display. while you are holding the start/stop button halfway down. disappears from the display while the camera records the still picture. 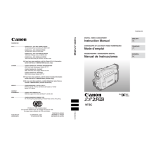 • For full details of how to use the Speedlite, refer to its instruction manual. 1/100 gives the best results. but an F number of less than F4 gives the best results. you turn the lock off, by pressing the EXP wheel once more). • Turn the Speedlite unit off when you do not require the flash. can not be used with the SA-1 Adapter Bracket (optional). to OPTURA. The guide number is set to 21. • You are unable to use the Speedlite 380EX’s bounce flash with OPTURA. position from fully closed to fully open. dark, or if the subject is spotlit. • Exposure lock is canceled if you change recording programs. the [ (Easy Recording) position. exposure level — the display bar is not shown. focusing well, it may be because the subject is not suitable for autofocus. It also has two functions which give you more control over focusing. will bring it into focus. When your main subject is not in the center of the display. When you want to shoot a moving subject. scene, and then on another. • The FlexiZone control frame appears in the display. 3. Use the FlexiZone controller to move the frame over the subject. the frame little by little. Press and hold to move the frame quickly. • The camera adjusts the focus to suit the area inside the frame. selector is set to any program except Easy Recording or NegativePositive Conversion. • The FlexiZone frame disappears from the display. • This also turns the autofocus back on, if it had previously been turned off. the point set by autofocus. can now adjust the focus manually. you want to return to autofocus. the zoom first, and then the focus. Use the FOCUS wheel to set the focus. move the focus further away. - Slide the POWER switch to VCR or OFF. - Select the [ (Easy Recording) program. - Turn the power off with the standby lever (or the camera turns itself off). off, but you can override it temporarily by turning the FOCUS wheel. 1. Open the camera menu and point the arrow at WHITE BAL. zoom in until it fills the display. • The SET display flashes then remains lit. will remain better than with the auto setting and you can continue recording. Subjects with one dominant color, such as sky, sea or forest. • Turn the digital zoom off (if neccessary) to set a more accurate white balance. AUTO setting, and then reselecting SET. obtained for two types of lighting at once. the [ (Easy Recording) program. the current white balance setting remains in the memory (except in the NegativePositive Conversion program). 1. Connect the camera to the VCR. • See “Connections for Playback on a TV screen” on p. 19. 2. Prepare the TV and VCR. and put the VCR in record pause mode. • See your TV and VCR instruction manuals for details. 2. Start to play it back while you monitor the picture on the TV. 5. Repeat steps 1 to 4 until your edited recording is complete. • The quality of the edited tape will be slightly lower than that of the original. images on the tape that is being recorded to. • m (LANC) is a trademark. It stands for Local Application Control Bus System. displays a blank blue screen; you cannot view the contents of the cassette. record the contents of the tape. the display) to suit your eyesight. give a choice of shooting positions. bars and adjust the length as shown. 50° and 86°F (10° to 30°C). reached the end of its life and must be replaced. How much power is left? the same day you plan to use it, or the day before. Always attach the terminal cover. remaining charge may cause damage to the battery pack, and reduce usage time. • Keep it away from fire (or it might explode). not leave it near a heater, or inside a car in hot weather, for example. • Do not try to disassemble or modify it. DL2025. Use of another battery may present a risk of fire or explosion. • Wipe the battery with a clean, dry cloth to ensure proper contact. fluids damage the stomach and intestines. dubbed to the tape after recording), or mix the balance between the two. (skip step number 2 below). 1. Set the camera to VCR mode. 2. Release the fixed level (for audio mixing only). a) Open the VCR menu and point the arrow at MIX SELECT. b) Select the VARIABLE setting and close the menu. You can only choose the output using the wireless controller. “STEREO2”, and “MIX”, each in turn. seconds after you last pressed the button. will show “FIXED” in the display. Avoid high temperatures and high humidity. • Do not leave the camera inside a car in hot weather, for example. • Be careful of heat radiating from video lighting equipment. • Do not take the camera into a humid room. form on the lens and internal parts (see p. 61). Do not point the lens or viewfinder at strong light sources. • Never point it at the sun, and do not leave it aimed at a bright subject. • Be especially careful when leaving the camera on a tripod. Avoid magnetic or electric fields. interference, or permanently damage the camera. Do not expose the camera to water. • Cover the camera when you are recording in rain or mist. qualified service personnel as soon as possible. • Sand and dust can damage the lens — be especially careful on windy days. • Vibration or shock can cause damage. • Do not use the viewfinder or LCD screen as a carrying handle. not function properly, take it to qualified service personnel. everything is still working properly. • These cautions also apply to accessories such as battery packs and cassettes. • Clean the LCD screen using a commercially available glass cleaner. of the screen. Wipe clean with a soft, dry cloth. is not a fault, and as the screen warms up the display will return to normal. treated cloth or volatile solvents such as paint thinner. • Do not use a wet-type cleaning cassette, as this can cause damage. Surinam, Taiwan, Trinidad and Tobago, USA, Venezuela. likely to be a problem, unload the cassette and put the camera in a plastic bag. then v flashes in the display. warning may not start flashing for 10 to 15 minutes. • You cannot load a cassette when condensation is detected. Refer to this checklist first if you have any problems with your camcorder. numbers in brackets for more information. VCR. Consult your dealer or service outlet if problems persist. • The tape has reached the end. properly attached (p. 8, 9, 55).
? The camera turned itself off. • The battery pack is exhausted (p. 9).
? There’s no picture in the display.
? The camera won’t focus. • The camera is on manual focus (p. 47). • The lens is dirty (p. 60). Refer to the notes on p. 42. • The cassette is not loaded (p.10). vertical light bar (“smear”) to appear. • Headphones are being used. • The batteries are dead or not inserted. • It is turned off (p. 28).
? The power indicator is flashing. • Check the screen displays (p. 73). available as an optional accessory. advantage of the extra range. control of difficult lighting conditions. sound track for your video productions. microphone from near to far. give up to 5hrs. recording time. down or getting in the way. This makes it possible to use the RU100 RF Unit with OPTURA. camera to a TV in your hotel room. AV-compatible PC, or display on TV. This makes it possible to use the FP100 film Adapter with OPTURA. T A L L Y L AMP . S ENSOR . . . . .
R EC MODE . . .
M I X SE L ECT . V OL UME . . . . .
D AT A CODE . .
D / T I ME SEL . D / T I ME SET . is turned on (p. 24). date and time (p. 29). SP: 60 minutes (with a 60 min. LP: 90 minutes (with a 60 min. 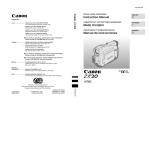 Canon is a trademark of Canon Inc.
● If you have any questions, call the Canon U.S.A.
sans frais au Canada 1-800-828-4040.